How Many Calories Are Burned With the "Last Chance Workout"? Use kettlebells to lose fat and gain muscle. According to fitness expert and kettlebells instructor Vanessa Bader, "Kettlebells give you a full body workout--strengthening, toning and mobilizing your body bilaterally." Training with kettlebells changes your body composition by decreasing fat and increasing muscle tone, thus improving health and fitness, and promoting weight loss. Always execute all kettlebell exercises with perfect technique to get the maximum benefit and prevent injuries. The basic idea behind weight loss is to burn more calories than you consume. The fundamental reasons for exercise are to increase health, fitness and functionally by making your body work slightly beyond its current physical capabilities. Kettlebell training is a highly effective form of exercise for overall health, wellness, strength, speed and flexibility and can be modified for specific conditioning goals such as sports performance, injury rehabilitation, strength training or weight loss. Kettlebell training can also be used as a supplement or change of routine from other types of exercise. Kettlebell training incorporates many combination exercises, meaning the exercises work several major muscle group at once. High repetitions, momentum and short rest periods between sets are important components of kettlebell workouts. These factors increase heart rate, increase oxygen intake and the number of calories expended, thus leading to weight loss and increased cardiovascular health. According to Vanessa Bader, "Kettlebell training strengthens and stabilizes the entire body." Increasing muscle size promotes weight loss. For every pound of muscle gained, your body burns 30 to 50 additional calories a day. This adds up to three pounds a year and 30 pounds in a decade. Therefore, even a small gain in muscle size decreases body fat levels and increases your muscle to fat ratio. 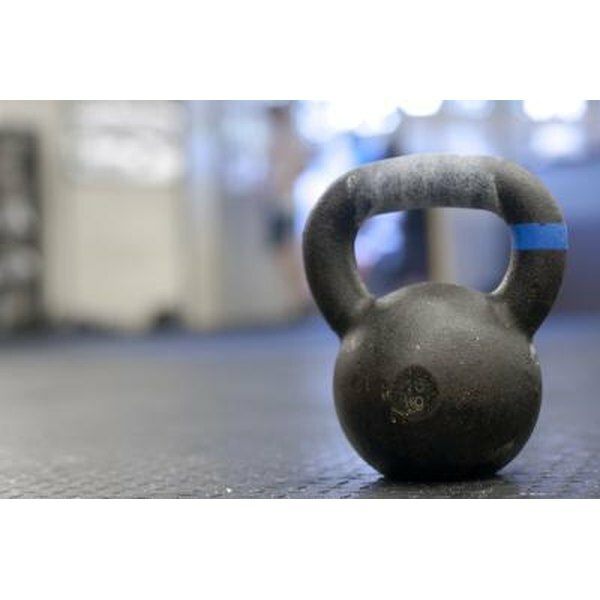 Kettlebell exercise increase your resting metabolic rate. Your metabolism is the number of calories you're burning at any one time, Your resting metabolic rate depends on your fat-free mass. Your fat-free mass is everything in your body that is not fat, including bone, blood, organs and tissues. The greater your fat-free mass, the more energy your body expends to keep going. The fitter person is more efficient at consuming energy, so he burns a larger quantity of fat, thus losing weight. Kettlebell training provides aerobic and anaerobic benefits. Anaerobic exercise, strength training, such as weight training, and sprinting use sources in the muscles for energy. Aerobic exercises, endurance training, like jogging, use oxygen in the blood for energy. Long sessions of aerobic exercise are most associated with weight loss, but a combination of aerobic and anaerobic exercises, called cross training, has proved to be more beneficial for overall health, fitness and weight loss. Proper kettlebell training develops your musculoskeletal system, cardiovascular system and increases your metabolism, leading to a positive change in body weight and body composition. Dr. Donald A. Ozello, D.C., is the owner and treating doctor of chiropractic at Championship Chiropractic in Las Vegas, Nevada. He is a writer for MyHealthZine.com, The Las Vegas Informer, SpineUniverse.com, "OnFitness Magazine" and various other print and online publications. Is Too Much Cardio Bad? How Many Calories Will You Burn Doing Core Synergistics? Can You Lose Weight From Power Rider Exercise? Does Gymnastics Help You Lose Weight? How Many Calories Are Burned in One Hour of P90x Plyometrics?